Everyone has an itch now and then, but if your hamster is scratching constantly and has other symptoms, like sneezing, runny eyes, flaky skin or hair loss, your little guy is experiencing more than just normal itching. Many things can cause a hamster to scratch. If your tiny rodent is itchy and shows signs of an abnormal condition, visit the vet so he can determine the cause of the symptoms and treat your little guy. Always consult an experienced veterinarian regarding the health and treatment of your pet. The parasites, like mites and fleas, that cause your other pets to itch and scratch can be the source of scratching in your hamster, too. Fleas can be passed on to your hamster from your dog or cat and mites can be transmitted from another hamster or habitat bedding. Pyrethrin spray or powder should do the trick of ridding your hamster of either type of parasite, but if he continues to scratch after you've treated him and his cage you should contact your vet to make sure your little guy hasn't developed an infection. Mites can take it a step further and cause you hamster to develop mange. This skin infection is contagious, and not only will give your hamster dry skin and make him scratch, but will also cause scabbing and hair loss. This condition is one for the vet to deal with, but for your part you should isolate your hamster if he shows signs of mange. Also, disinfect his cage or tank, his toys, dishes and water bottle, and dispose of all his bedding. If your little rodent starts scratching continually, but also has trouble breathing, and is sneezing and has runny eyes, he could have an allergy. Many things could be at the root of his allergic reaction, including perfume, furniture polish or a food. If you use cedar shavings for his bedding, that is another possibility, as cedar has been known to cause all sorts of medical issues from allergic reactions to liver disease. If your hamster suddenly displays allergy symptoms after something new has been added to his habitat or his diet, eliminate the new item to determine if it is the cause for your little guy's discomfort. If the scratching and other symptoms continue, contact your vet for help in identifying and treating the problem. Sometimes an improper or insufficient diet can give your hamster the itchies. 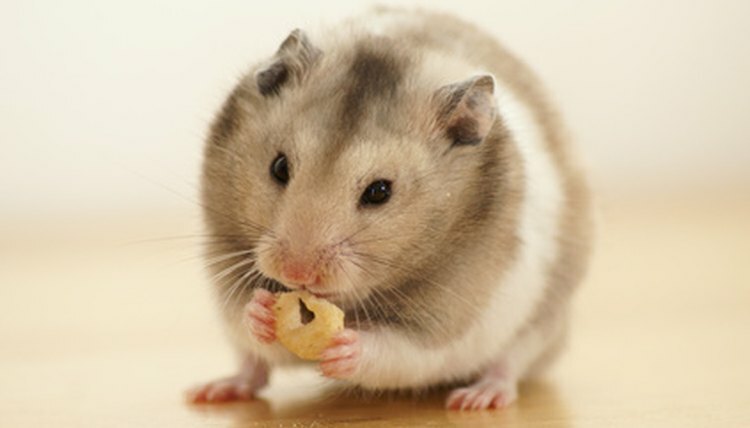 While hamsters enjoy hoarding and eating sunflower and other types of seeds, they shouldn't be the basis of a hamster diet. Hamster pellets are developed with the protein and other nutrients that hamsters need to stay healthy and are a valuable food to build off of. However, don't stop there. Supplement your hamster's main diet of pellets with healthy, fresh treats, like apples, carrots, peas, unsweetened cereal and salt-free crackers. Dwarf Hamsters; Sharon L Vanderlip, D.V.M.